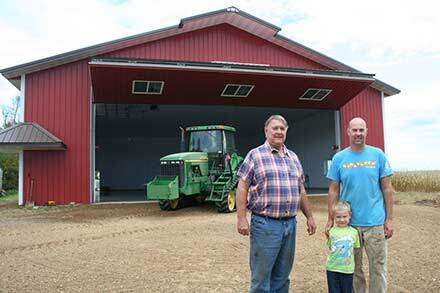 Chad Hoese of Stoney Creek Farms has Schweiss bifold and hydraulic doors at his Glencoe, MN farm. 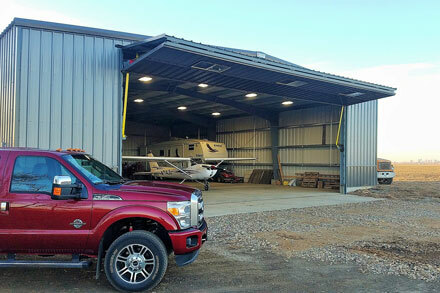 For his newest door, he replaced the sliding doors on the existing building and decided to go with a hydraulic door because he wanted all the headroom he could get. 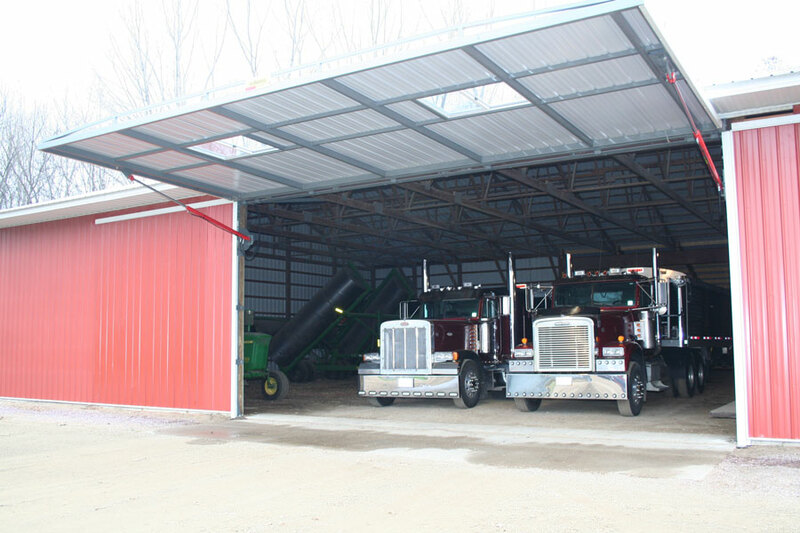 A large 44' x 16' Schweiss bifold cable door was installed on this new machine shed in 2006. Since that time it was upgraded with a liftstrap conversion. 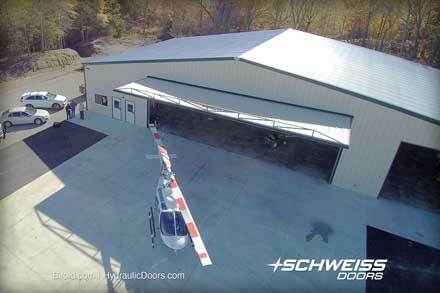 Hoese likes both styles of Schweiss Doors. 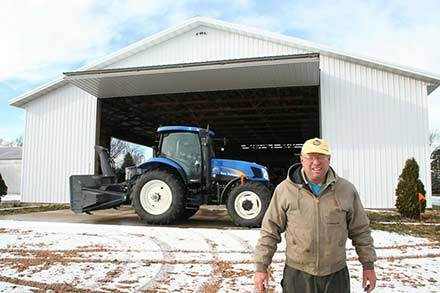 Chad Hoese at age 29 is a new-generation, unmarried farmer producing corn, soybeans and a herd of 60 dairy heifers at Stoney Creek Farms, a 2,500 acre spread just three miles north of Glencoe, MN. 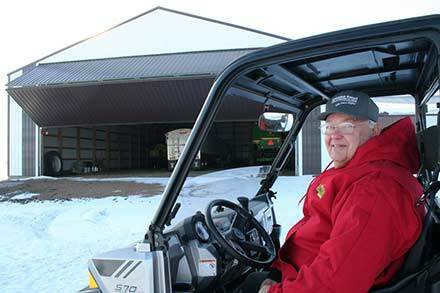 He grew up learning farming from his dad, Terry, and took over the entire operation after his father died five years ago. 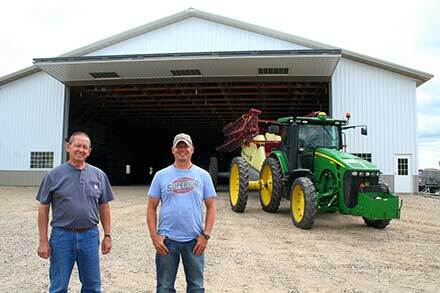 Since then he has stepped up his rural craft to expand his machinery line, buildings and modernize the farm that keeps him busy six days a week and twice on Sundays, as Chad explained it. 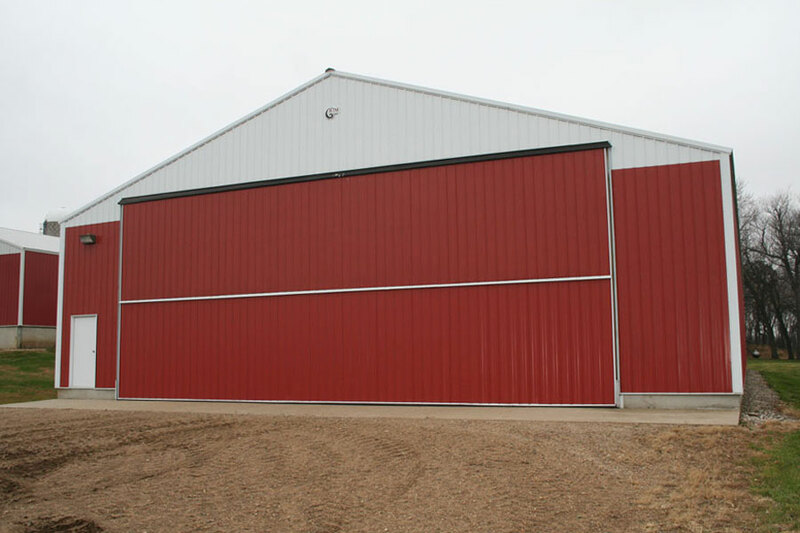 His latest acquisition was to put a Schweiss One-Piece Hydraulic 29.10' x 14' clear door on an existing woodframe cold storage building. 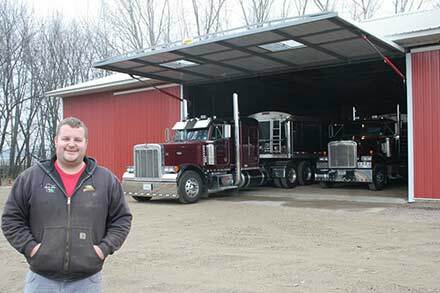 He uses it to shelter two sparkling semi trucks and other equipment. 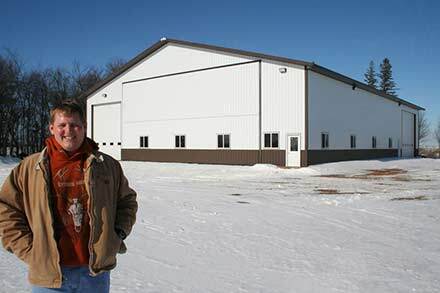 "The sliding doors that were on there were a bear in the winter and these particular ones were a bear in the summer too," said Hoese. 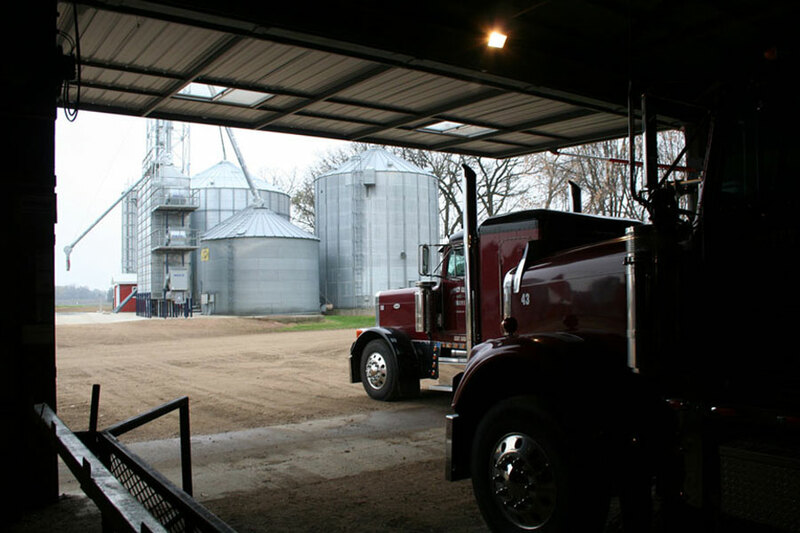 "We tried raising them up and they would hit on the top, then lowering them down, and they would drag on the bottom, birds would nest behind them, they were a pain in the neck. I asked Mike Schweiss if he took trade-ins . . . he said he didn't want them old doors." The hydraulic door is so new that Hoese still has to attach the weather seal at the bottom. 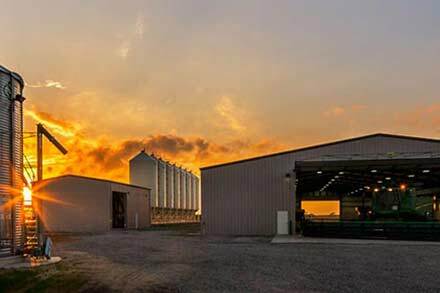 Fall harvest comes first. 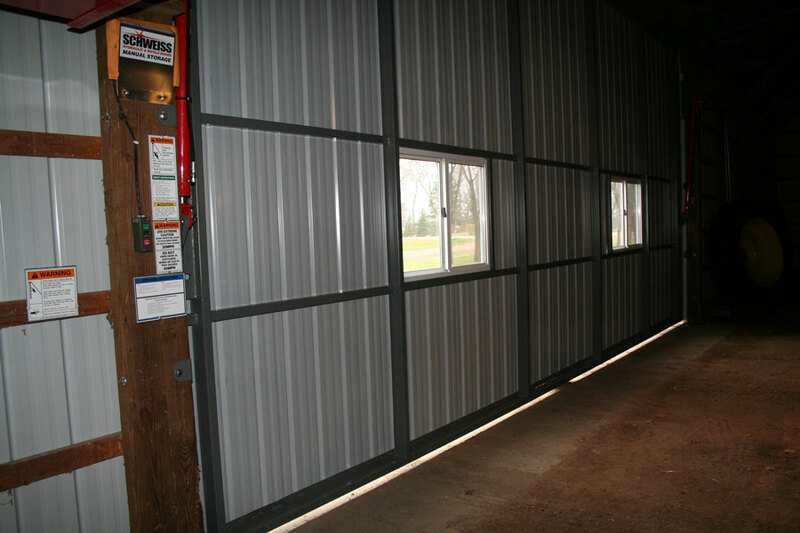 The large bifold/liftstrap door on the machine shed gives a nice clean look when closed. 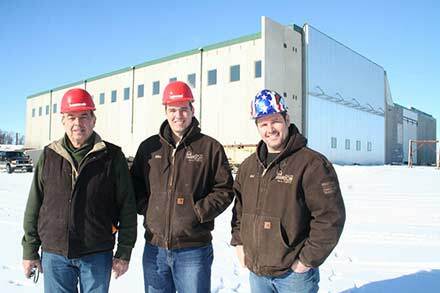 Hoese said his next Schweiss door will probably be another bifold. He's impressed with the new strap latch system that just came out. 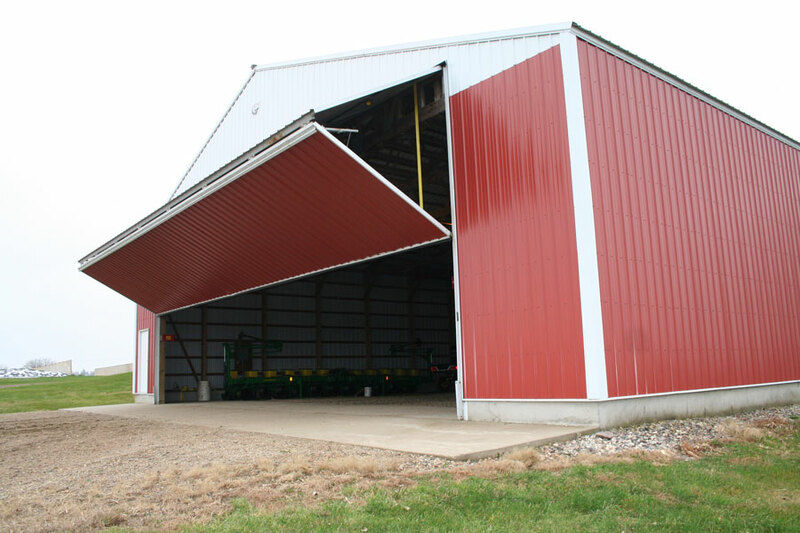 Another much larger 44' x 16' Schweiss bifold door went on a bigger machine shed nine years before the hydraulic. 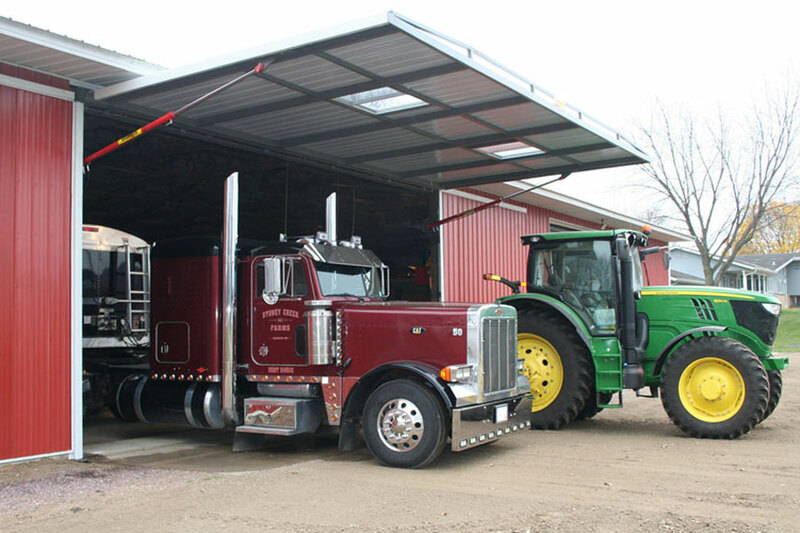 At the time the bifold was put in it operated with a cable lift system, which has since been upgraded with a liftstrap conversion kit. "Three or four years ago we had Schweiss do the strap conversion and we now have the autolatch with straps instead of cables. We had trouble with springs breaking and cables winding up. The straps are so much superior to the cables. I would have put another bifold door in the other building but we needed all the headroom we could get for a sidewall door. 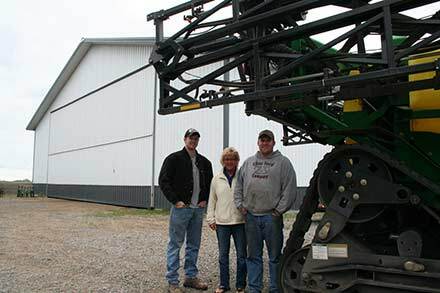 For this new door, Hydraulic with the self-supporting header and new wrap-around hinges was the way to go," said Hoese. 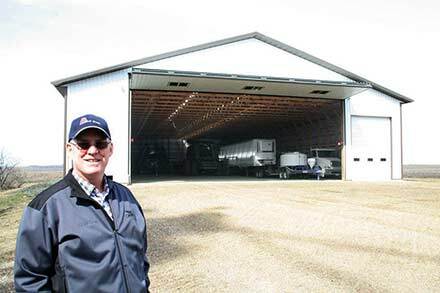 Hoese said he probably first heard about Schweiss Doors when Ram Buildings of Winsted built the big shed for his dad back in 2006. 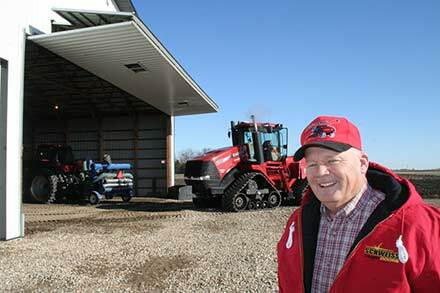 He got to know Mike well at the Louisville, Kentucky farm show a couple of different times. He likes both styles of Schweiss doors. 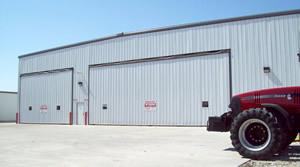 Two good-sized windows on the hydraulic door allow natural daylight into the building and give the door operator a peek outside when opening the door. 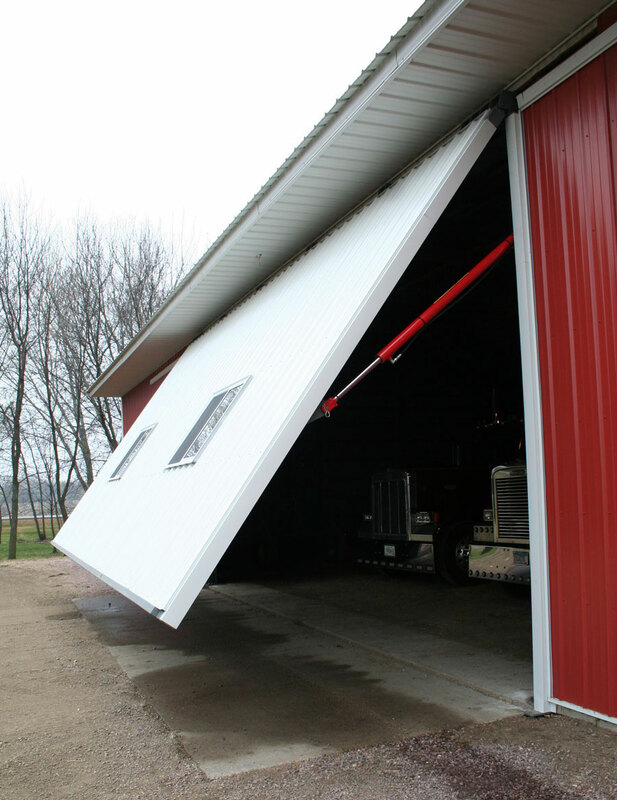 The bifold door, now with a liftstrap conversion, lifts quickly and trouble-free. 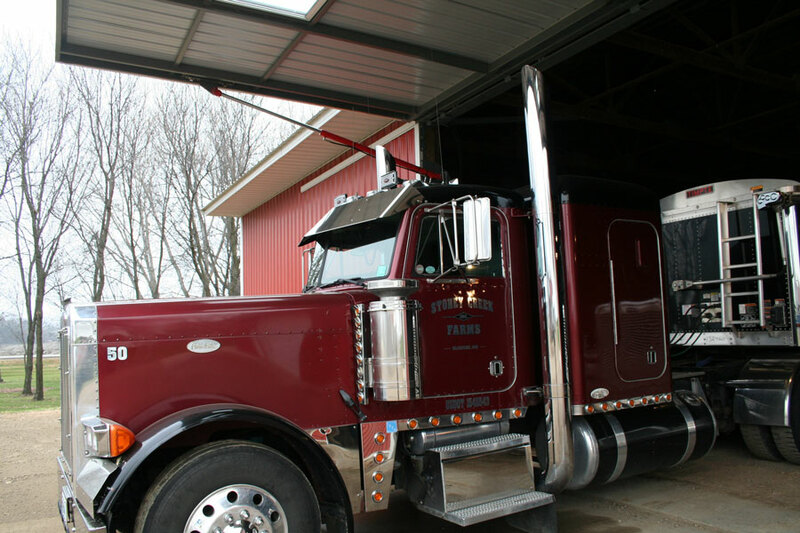 The 16' height is tall enough to bring in his biggest machinery and semi-trucks. 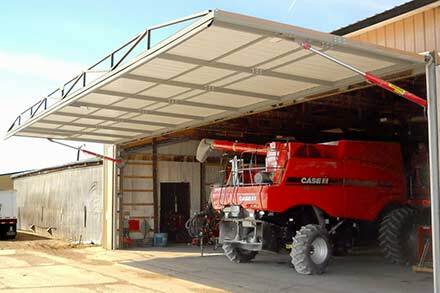 The hydraulic door provides a nice shaded canopy when wide open. 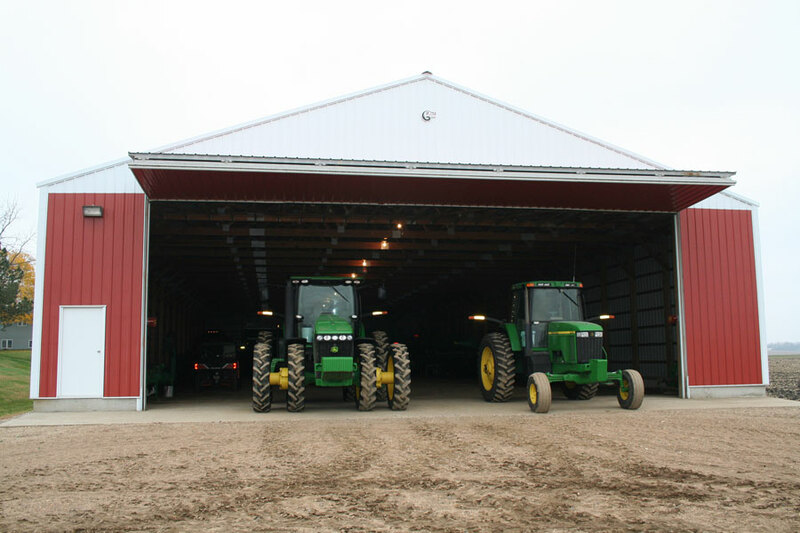 It's wide enough to house two large semi grain trucks with room to spare. 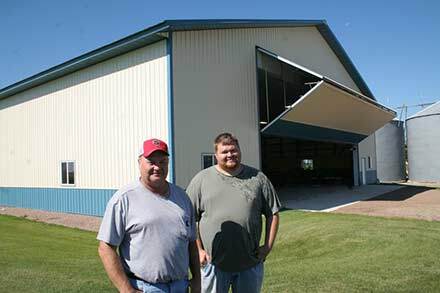 "We had good luck with the bifold door we have so that's why I came back to Schweiss for the hydraulic door. 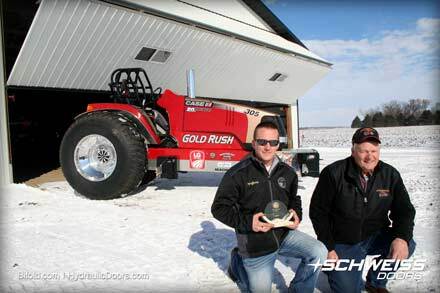 Schweiss has a good product and gives good service, so why not get another one," explained Hoese. 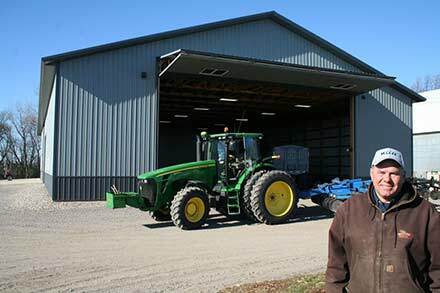 "I like the hydraulic door because it is so simple, there aren't many moving parts so hardly anything can go wrong - it's just up and down, you know. 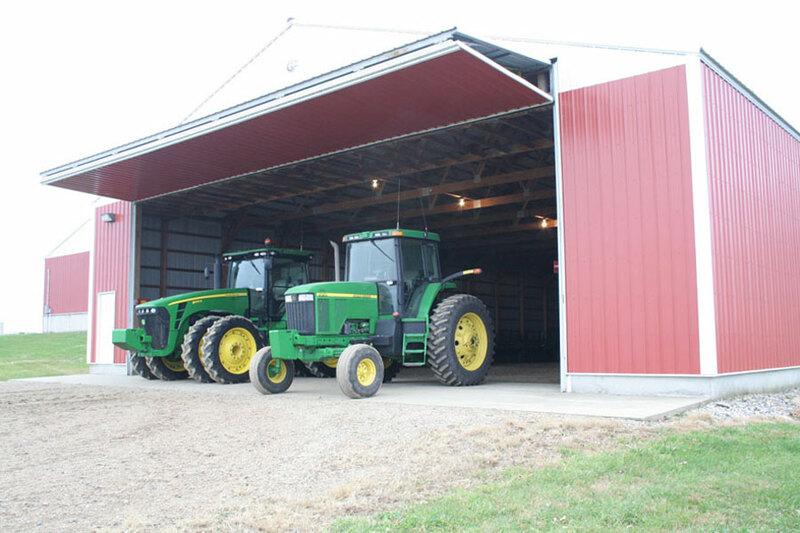 My hydraulic door is smaller, and it goes up a little faster than my big bifold. 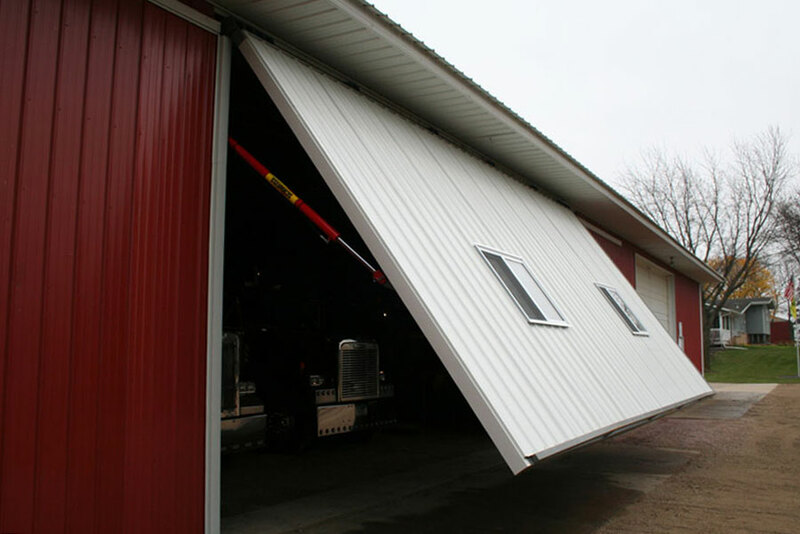 I think if I had the opportunity to put another door on another building endwall, I'd probably go with a bifold because there is a little bit less stress on the building and bifolds go up so you don't have to move the snow. 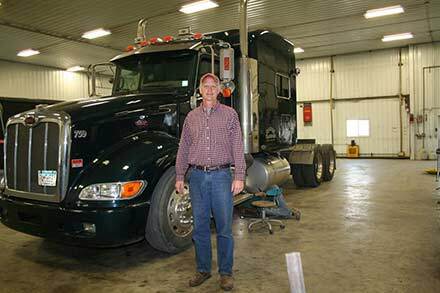 I also like his new autolatch system which I just saw at a show this summer." 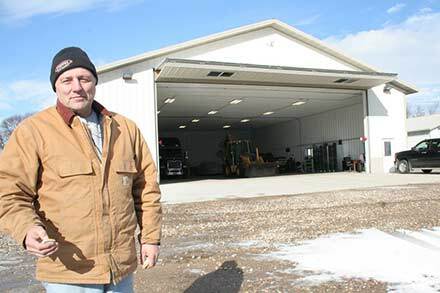 Hoese said he partially helped with the hydraulic door installation before the Schweiss Door crew came out to finish it off. 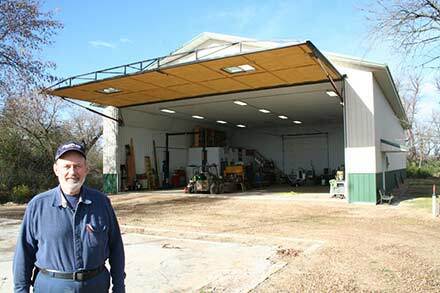 He measured the opening himself, did some welding and pre-hung the door. 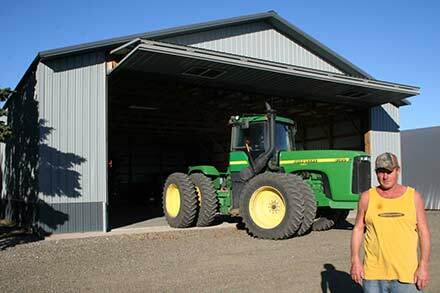 He got the tin off the old door in a couple hours to prepare for new exterior cladding and said the entire installation probably took about eight hours. When the door arrived his measurements were right on the money. 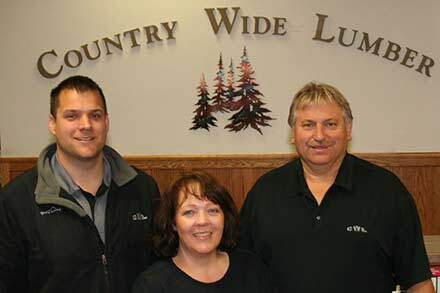 "Mike was helpful with suggestions. On the inside we ran some braces back to the headers. He encouraged me to get the new wrap-around hinge. It really works well. I'm not a door expert, it looks good and works smooth; the grease zerks are really great and the pump works good. 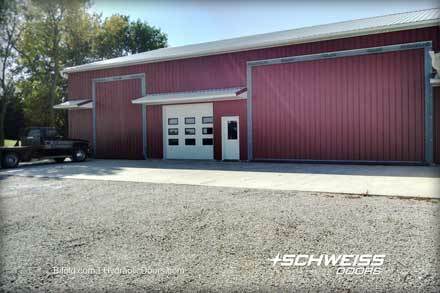 I would recommend Schweiss doors to others. 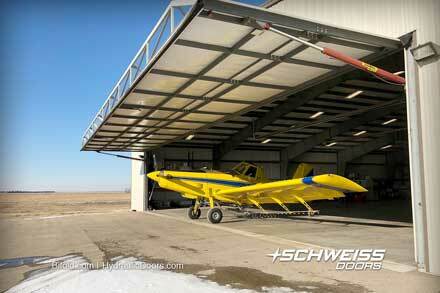 "We had good luck with the bifold door we have so that's why I came back to Schweiss for the hydraulic door. 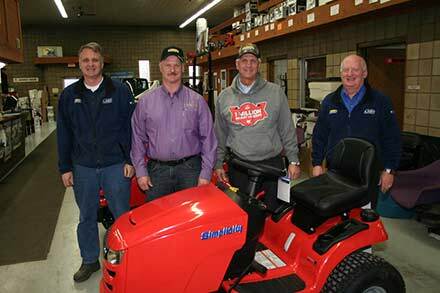 Schweiss has a good product and gives good service, so why not get another one? I like the hydraulic door because it is so simple; there aren't many moving parts, so hardly anything can go wrong - it's just up and down, you know. 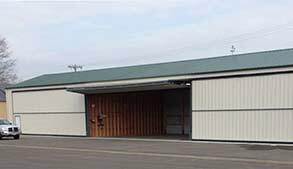 I think if I had the opportunity to put another door on another building endwall, I'd probably go with a bifold because there is a little bit less stress on the building and bifolds go up so you don't have to move the snow. 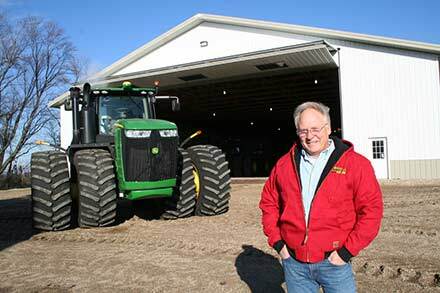 I also like his new autolatch system which I just saw at a show this summer." 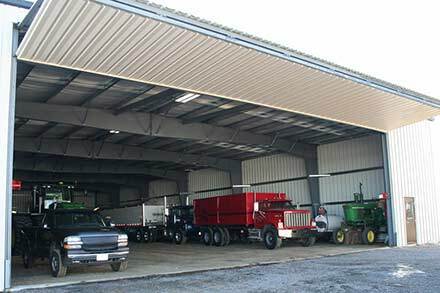 When the 44' x 16' bifold door is wide open, it also provides a nice shaded canopy. 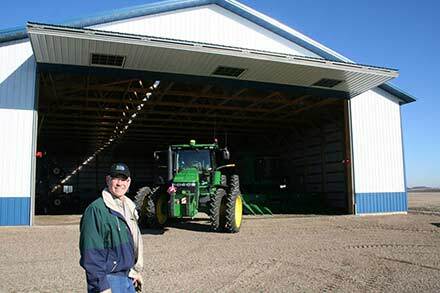 Hoese stores some of his tractors, a combine and other equipment inside the building. 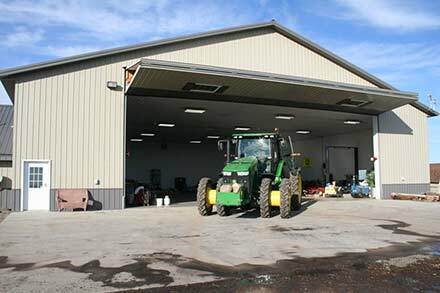 Hoese measured up the opening for his new hydraulic door and did a lot of the installation work himself. When the door arrived, he said it fit like a glove. 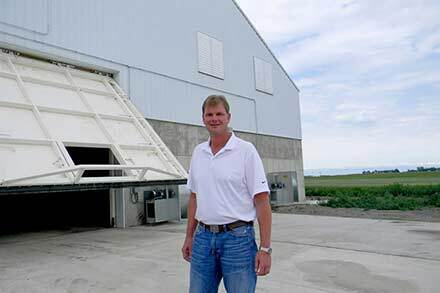 When open, the 16' tall bifold door gives a 30" wedge. The door has a manual latch system. 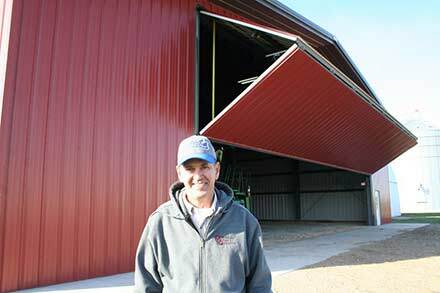 He said his big bifold opens up in about the same amount of time as the hydraulic door. 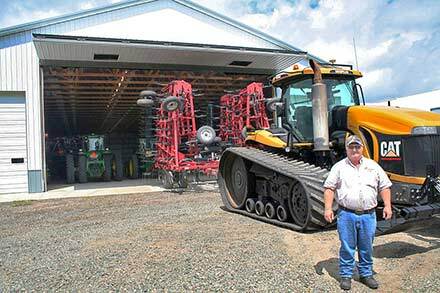 "Three or four years ago we had Schweiss do the strap conversion and we now have the autolatch with straps instead of cables. We had trouble with springs breaking and cables winding up. The straps are so much superior to the cables. I would have put another bifold door in the other building but we needed all the headroom we could get for a sidewall door. 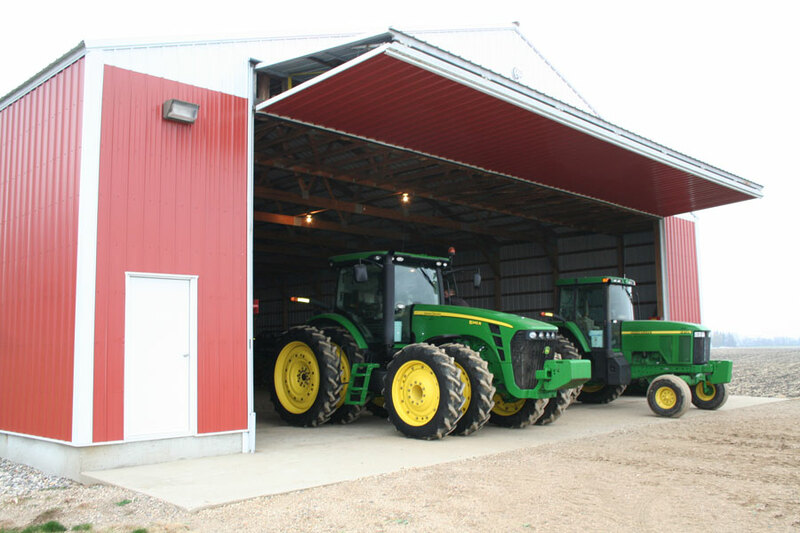 For this new door, Hydraulic with the self-supporting header and new wrap-around hinges was the way to go." 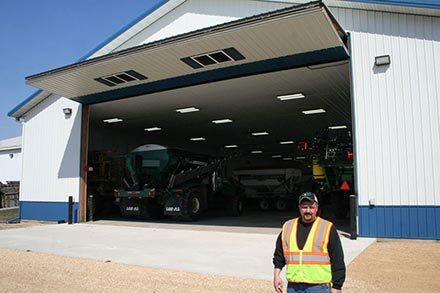 The hydraulic door height is tall enough to give Hoese the flexibility to park most any of his trucks or equipment into the shed. The door has the new wrap-around hinge design. 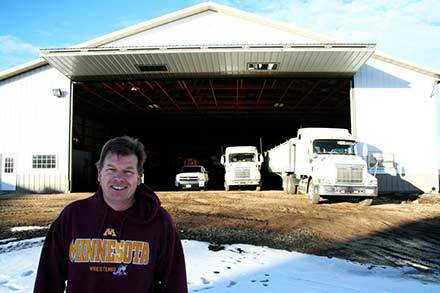 From the inside looking out, Hoese has a straight shot which makes backing in his semi's in and bringing them out of the pole shed easy. 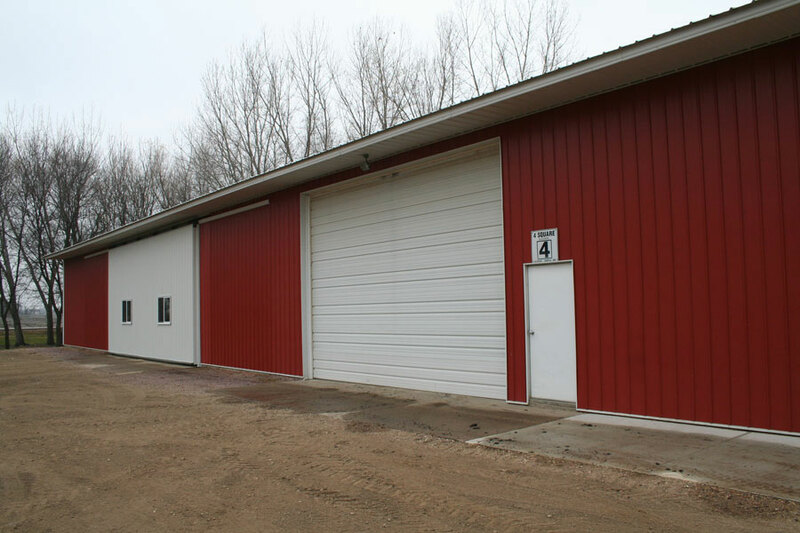 White steel siding on the outside of the hydraulic door gives it a nice clean look. 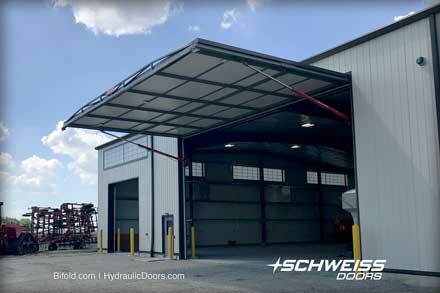 Two powerful cylinders lift the door in less than 30 seconds. 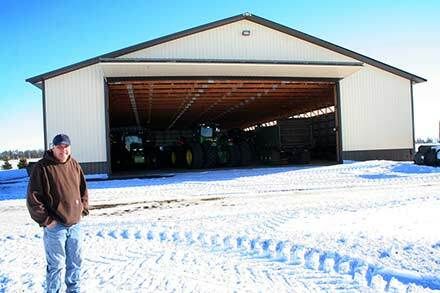 Hoese chose a Schweiss 29'10.25" x 14'0.5" custom-made hydraulic door for this pole shed because it gives him the maximum amount of headroom when it's completely opened under the roof eave. 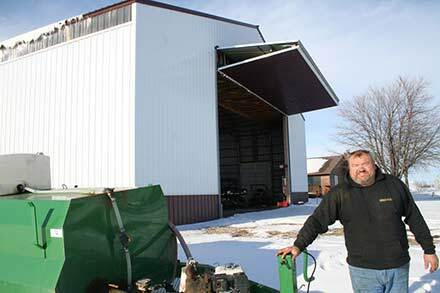 The building originally had a sliding door that gave him year-round troubles.